Some pets are born with special needs such as missing a paw or an eye. Others become that way through an accident. Still others, like our mascot Snickers (left), lose the use of their hind legs late in life due to a freak medical reaction. Yet, our pets don’t let these hindrances get in their way. They can be just as cuddly as healthy, four-pawed pets – as you know if you’ve ever spent time with one of them. In honor of the recent, “specially-abled” pets day, we wanted to celebrate these special animals as well as highlight some of the tools available to help them. If you’ve ever seen a “tri-paw” scoot around on three legs, you know they can do just fine. It’s typical of three-legged pets to develop a hopping motion to get them around. However, that motion puts a lot of pressure on the remaining joints and veterinarians say it can cause severe arthritis or other issues down the road. If you think about it, it makes sense. Bouncing puts more stress on the joints which can cause problems later. You can reduce this stress by keeping your pet thin – extra weight means more joint stress. Your veterinarian may even recommend a special prosthetic device. Some companies will custom make a new leg for your pet so your pet can be balanced on all four legs again. When Snickers lost control of his hind legs and suffered with peeling paw pads due to a severe medical reaction, we were desperate to help him walk again. Dog boots wouldn’t stay on and didn’t help with the mobility. His owner finally came up with our suspender system to connect to boots. 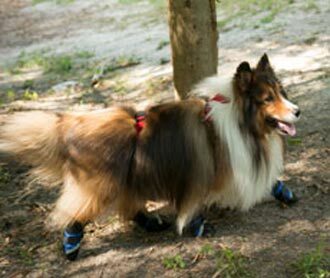 The suspenders keep the boots in place and give extra support to help your pet walk easier. Doggie ramps can also be useful. When your dog is no longer to jump into the back of the car or climb steps, doggie ramps provide a gentle lift so your pet can maintain some independence. Dogs love massage and specially-abled pets are no different. A daily massage will help you catch any change in your pet’s body – odd lumps, muscle pain, — that can mean the difference in early detection. If your pet isn’t used to massages, wait until he’s sprawled out in a relaxed state near you and then move nearby and start petting. Use long, slow strokes to relax him. If your pet is limping more than usual or otherwise showing signs of joint pain, you can focus there. First, put your hands lightly on the joints so they receive the heat coming from your hands. By warming the joints, you’re helping them relax. Next, use a gentle kneading motion with your open palm to slowly massage near the joint, don’t put a lot of pressure at first and see how your dog reacts. If your dog remains calm and relaxed, you can keep going. The gentle motion helps push blood and oxygen through your pet’s body to rejuvenate him. If you do this every day, or every other day, you’ll a) be attuned to changes in your pet’s body which can help you catch health issues before they turn into problems and b) you’ll help your pet’s muscles and joints stay supple. Have you had a “specially-abled” pet? If so, how did you help them?